This two-day Artificial Intelligence summit will bring together world leaders to define the underlying pillars of governance, business and society augmenting the world’s happiness. United Arab Emirates (UAE) will host the world’s leading Artificial Intelligence (AI) Summit -AIE from April 30 to May 1, 2019. Its aim is to empower global dialogue on the future of government, business and society. The inaugural 'AI Everything', AIE will take place at the Dubai World Trade Centre. This two-day AI summit will bring together world leaders to define the underlying pillars of governance, business and society - augmenting the world’s happiness. It will be hosted by the UAE National Programme for Artificial Intelligence, with the support of International Telecommunication Union, ITU, and the World Intellectual Property Organisation, WIPO, and in strategic partnership with Smart Dubai. AIE will unravel real-world use cases across industries, and forge collaborations and partnerships, hosting over 130 influential speakers. • In line with the UAE AI Strategy 2031, AIE will envision how the UAE has emerged as a global test bed for AI innovation and look at ways to create new vital markets that unlock high economic value for a sector that is expected to contribute (USD 320 billion) to the Middle East economy by 2030. • Inspired by the strategy to establish the UAE as an innovative AI investment destination, the summit seeks to convene the world’s leading investment community to explore integrated smart solutions that ultimately boost the performance of private and public sector entities across all levels imaginable, while creating a vibrant AI start-up and educational ecosystem. • The exhibition will serve as a knowledge exchange platform for bringing those solutions into the mainstream. • The show will convene more than 100 global revolutionary AI tech companies and start-ups from more than 30 countries. • Alibaba Cloud, Alteryx, BrainCo, Dataiku, DEWA, Dubai Health Authority, Google, Hikvision, Hewlett Packard Enterprise, Huawei, Injazat, Microsoft, PwC, Dubai Roads and Transport Authority (RTA) and SenseTime will be amongst other participating companies that will feature the most transformative AI solutions. Kaggle is the largest online community of the world’s data scientists and machine learners. The event will see the region’s largest gathering of data scientists, including four of the world’s top six ranked Grandmasters, who will participate in the ‘Dubai Police Challenge’. They will compete to come up with the best AI-powered solution that furthers the Dubai Police’s goals of optimising the safety and overall quality of life of its citizens. AIE will witness the Middle East’s debut of Kaggle Days. • Summit will feature the Supernova Challenge with cash prizes worth USD 100,000. • Entrepreneurs from around the world will demonstrate their AI-driven products, including a virtual agent that will mark a generational shift in how transactions are conducted online. • Summit will showcase AI software which will enable the blind to safely navigate regular streets and avoid obstacles independent of physical assistance, etc. The Social Democratic Party (SDP) recently emerged winner in general elections in Finland. SDP has emerged victorious with narrow margin beating the right-wing Finns Party in the Finnish parliamentary elections. The Finnish government of Juha Sipila resigned in March 2019 after admitting a failure to achieve social welfare and healthcare reform goals. With 99.3 per cent of the ballots counted, the SDP, headed by former union leader Antti Rinne, obtained 17.7 per cent of the votes and 40 seats in Parliament, while the anti-immigration Finns Party, who is also in the opposition - obtained 17.5 per cent of the votes and 39 seats, Efe news reported. Finland's entire government has resigned over its failure to achieve a key policy goal on social welfare and healthcare reform in March 2019. Prime Minister Juha Sipila said in his resignation speech that he was hugely disappointed in the outcome. Finland has an ageing population that is putting financial pressure on its social welfare systems. Increasing number of people live longer in retirement, the cost of providing pension and healthcare benefits can rise. As per the Eurostat report, in 2018, those aged 65 or over made up 21.4% of Finland's population, the joint fourth highest in Europe alongside Germany with only Portugal, Greece, and Italy having a higher proportion. • The nationalist Finns Party got more votes than the conservative governing National Coalition Party (Kokoomus) headed by Acting Finance Minister Petteri Orpo, which secured 17 per cent of the votes and 38 seats. • However, the Centre Party, headed by Prime Minister Juha Sipila emerged as biggest loser. It obtained 13.8% of the total votes in Parliament. This result is worst for the party in the history ever. In 2015, the Centre Party had held 49 seats after winning more than 21% of the vote. five more than they obtained in 2015. • Other parties got seats in the new 200-seat Finland's Parliament Eduskunta are the Swedish People's Party with 4.5% of the votes and 9 seats and the Christian Democrats with 3.9% of the votes and five seats. · In line with the UAE AI Strategy 2031, AIE will envision how the UAE has emerged as a global test bed for AI innovation and look at ways to create new vital markets that unlock high economic value for a sector that is expected to contribute (USD 320 billion) to the Middle East economy by 2030. · Inspired by the strategy to establish the UAE as an innovative AI investment destination, the summit seeks to convene the world’s leading investment community to explore integrated smart solutions that ultimately boost the performance of private and public sector entities across all levels imaginable, while creating a vibrant AI start-up and educational ecosystem. · The exhibition will serve as a knowledge exchange platform for bringing those solutions into the mainstream. · The show will convene more than 100 global revolutionary AI tech companies and start-ups from more than 30 countries. · Alibaba Cloud, Alteryx, BrainCo, Dataiku, DEWA, Dubai Health Authority, Google, Hikvision, Hewlett Packard Enterprise, Huawei, Injazat, Microsoft, PwC, Dubai Roads and Transport Authority (RTA) and SenseTime will be amongst other participating companies that will feature the most transformative AI solutions. · Summit will feature the Supernova Challenge with cash prizes worth USD 100,000. · Entrepreneurs from around the world will demonstrate their AI-driven products, including a virtual agent that will mark a generational shift in how transactions are conducted online. · Summit will showcase AI software which will enable the blind to safely navigate regular streets and avoid obstacles independent of physical assistance, etc. The Social Democratic Party (SDP) recently wins general elections in Finland. SDP has emerged victorious with narrow margin beating the right-wing Finns Party in the Finnish parliamentary elections. The Finnish government of Juha Sipila resigned in March 2019 after admitting a failure to achieve social welfare and healthcare reform goals. 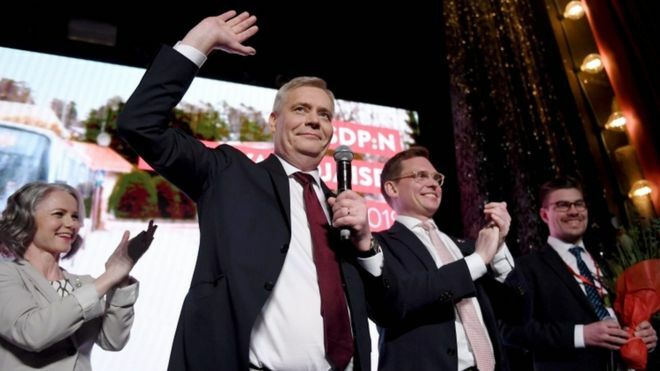 · The nationalist Finns Party got more votes than the conservative governing National Coalition Party (Kokoomus) headed by Acting Finance Minister Petteri Orpo, which secured 17 per cent of the votes and 38 seats. · However, the Centre Party, headed by Prime Minister Juha Sipila emerged as biggest loser. It obtained 13.8% of the total votes in Parliament. This result is worst for the party in the history ever. In 2015, the Centre Party had held 49 seats after winning more than 21% of the vote. · Another, Green League party gained the most support, after the SDP, capturing 11.5% of the vote and 20 parliamentary seats, five more than they obtained in 2015. · Other parties got seats in the new 200-seat Finland's Parliament Eduskunta are the Swedish People's Party with 4.5% of the votes and 9 seats and the Christian Democrats with 3.9% of the votes and five seats.